Nonprofits that give funds to political campaigns seem to be everywhere. Who are the funders who put their money into these 501c4s? These nonprofits are not required to disclose their donors, and because of this, whether on the right or the left (yes, they do exist on both sides), their funds have earned the moniker “dark money.” But last week, a federal appeals court in California ruled that two groups, both conservative charitable foundations, will have to turn over lists of their top donors to the California attorney general. 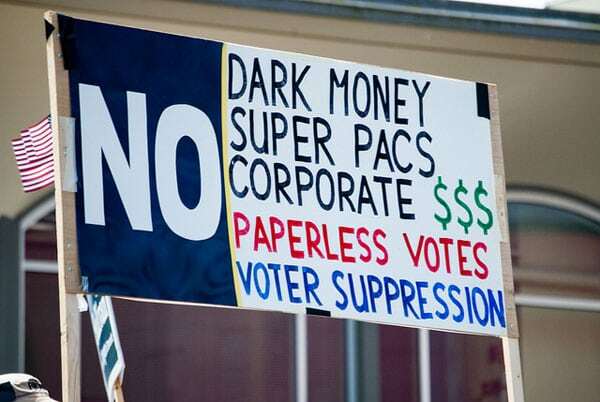 Bringing even more clarity to the “who’s who” of dark money, Issue One, a nonpartisan, nonprofit advocacy organization focused on political reform and government ethics, issued a report, “Dark Money Illuminated,” that profiled the top 15 dark money organizations and their donors. In addition, Issue One has developed and made accessible, through their website and ProPublica, a searchable database of nearly 1,200 transactions related to these dark money actors. Taken together, there seems to be a crack in the wall of anonymity of dark money donors. The California court case will not bring any names to light, but it will be a thorn in the sides of the Americans for Prosperity Foundation and the Thomas More Law Center, which must now disclose the names of their major donors to the state attorney general. These are the same names they provide to the IRS, and California Attorney General Xavier Becerra argued he needed these names to ensure that none were involved in fraud. The judges found this request reasonable, since the attorney general cannot reveal the names of these donors. The charities’ arguments that revealing the names would impact donors’ giving was given short shrift by the court. But all is not settled here. In a case NPQ covered back in August, another federal court also ruled in favor of disclosure of dark-money donors in the Ohio Senate election of 2012, ruling that Crossroads GPS would have to disclose its donors. Crossroads GPS appealed to the Supreme Court, and on Saturday of this week, just after the California ruling, Chief Justice Roberts issued a stay in the Ohio case. The Chief Justice’s ruling followed a three-judge DC circuit panel ruling against the stay earlier in the day. As Politico reports, “It is not clear whether Robert’s order is a short-term measure intended to allow further consideration of the issue by the justices, or whether it will remain in place through this fall’s midterm elections. Attorney Robert Kelner described the DC Circuit’s denial of the stay a “significant decision” on Twitter. This ruling could be the basis for an appeal and another stay in the just-decided California case. These cracks in dark money keep opening and closing, and yet, there are other ways outside the courts to light the way to who these donors are. The Dark Money Illuminated report profiles the top 15 dark money organizations and their donors, but this is just the tip of the iceberg. In looking at each of these 501c4s, the report learned that contributors were not just individuals, but trade associations like the American Petroleum Institute, the Motion Picture Association of America, and the Pharmaceutical Research Manufacturers of America. The report indicates that more than half the funds spent on elections ads were negative in nature, setting a tone for much of the 2016 campaign. The report also notes major discrepancies between what some of these nonprofits reported spending on politics to the IRS compared to what they told the Federal Elections Commission (FEC) they spent on ads that advocated for the election or defeat of federal candidates. Complaints have been filed against four of them with the FEC, saying they should have registered as political committees, not as 501c4s, and therefore should have disclosed their donors. In each case, the FEC has been unable to get the required votes to act against them. No surprises there.